The shape of death matters to policy makers, not so much to the individual. This image shows the number of expected deaths from age 65, based on a normalised starting group of 100,000 lives at birth. 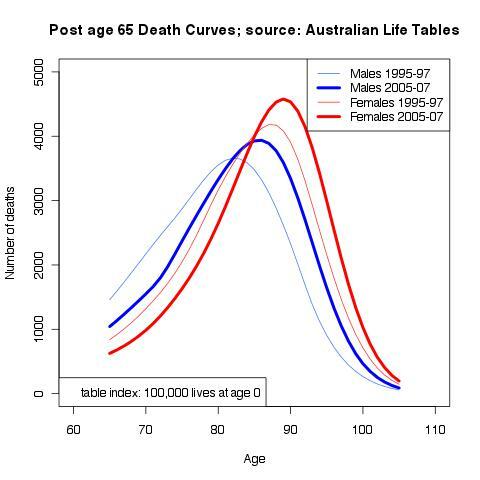 The underlying data has been extracted from the Australian Life Tables, published by the Government Actuary. Two tables are plotted here, based on studies in 1995-97 and 2005-07.There are several interesting points to note. There is no obvious evidence yet that males are closing the gap to females. Women live longer than men, on average. But note that there is improvement over the 10 years between the two studies for both genders. The very upper age limits show limited improvement. There are more significant improvements in the ages up to mid 90s. One of the pillars of the Australian retirement incomes policy is the age pension, a means-tested defined benefit that is effective in looking after retirees on an equitable basis, regardless of how long they live. It has been in place for over 100 years. The second pillar of our retirement income policy, private superannuation, developed mostly since 1983, scores very badly on all measures. It has no regard to longevity. In consequence, policy makers have resorted to forcing up the rate of saving during the accumulation phase. It is a blunt instrument and hardly imaginative, to force ever increasing rates of saving on the basis that people might live a long time in retirement. Clearly, forced retirement savings is a burden and unjustified Government imposition on the property rights for half the population. We just don’t know which half.